Because a Java Code Signing Certificate needs to be issued by a trusted certificate authority, you will need to purchase one from one of the providers listed below. Use the comparison chart below to find out which Java Code Signing Certificate will best meet your needs and provide the greatest value. You can compare prices, compatibility, provider reviews and ratings, support, and other features. After clicking the Buy Now button, make sure to select Java as the certificate type so that the provider generates the certificate in the appropriate format. To learn more about code read What is Code Signing? 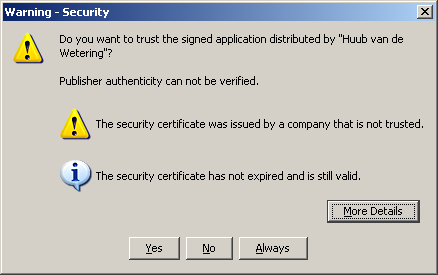 or How to Sign Applets Using RSA-Signed Certificates.